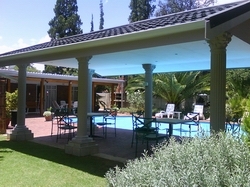 Mantovani Guesthouse is a unique, up-market Guesthouse in the heart of Welkom. We are conveniently situated near the Major routes and within walking distance of a large variety of shopping centres, banking and entertainment facilities, restaurants and other attractions. We offer stylish and comfortable En-Suite Bedrooms, each with its own entrance, as well as a Conference room facility for up to 30 delegates. 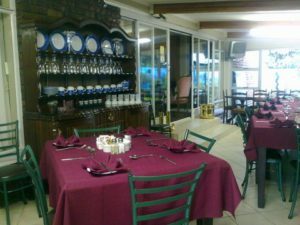 Our mouthwatering breakfasts are served in the Breakfast Room, which overlooks the tranquil courtyard area.We guarantee great comfort, warm & friendly service, as well as value-for-money rates. 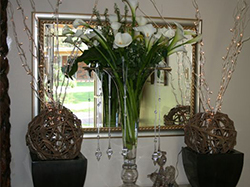 Your hosts, Kobie & Sonja, together with their experienced and friendly staff, look forward to welcoming you to Mantovani Guesthouse soon and making sure your stay is an exceptional one. All Rooms are ensuite. Some full bathrooms some shower only bathrooms. Disabled friendly room 6 Wheelchair acessable. Extra Blankets. One per person sngel or one per double room. 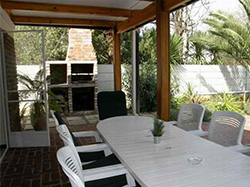 Each room with own part of patio. Guests are kindley requested to consider other guests at all times. Children is accompaning their parents: The Parents should please see that they are save and always supervised by them if playing or using the pool area. or usingthe recreational facilities. Proxima to be rented or your own. Internet access – Ask for code at reception. Own remote for motor gate. Electric fenced undercover parking of the street. Secured in yard. Chubb Security with armed response 24 hours per day.